Hezbollah has fired more than 800 rockets since fighting with Israel began again on July 12 — with some landing as far as 25 miles into Israeli territory. One radar-guided missile damaged an Israeli warship off the Lebanese coast, and another destroyed an Egyptian fishing boat. Israeli officials have claimed — and defense and Middle East analysts in Washington agree — that Hezbollah's arsenal has increased in both size and range, with help from Iran. U.S. intelligence estimates that, as of Thursday, a third of Hezbollah's rocket supply has been fired or destroyed by the Israeli bombardment of Lebanon. Israel says it will continue its military campaign until all the rockets are removed from the border area. "Three things are new," said John Pike, the director of GlobalSecurity.org. "The longer range of the rockets, Hezbollah firing them in far larger numbers and the cruise missile that they hit the Israeli ship with." Hezbollah is suspected of having as many as 13,000 short-range artillery rockets — referred to as Katyusha rockets — which Pike says can be set up quickly and fired remotely. These low-tech weapons have a range of roughly 12 miles and are generally inaccurate. But rockets that hit cities deeper into Israel, like the ones that killed eight people in Haifa, are suspected of being a newer version of the Katyusha — most likely the Iranian-made mid-range Fajr-3 and Fajr-5. "This is definitely beyond their ability to build themselves," said Guy Ben-Ari, a senior fellow at the Center for International and Strategic Studies. "These are military grade. There is nothing secondhand or homemade about them." The problem for the Israeli military with these types of rockets is that they fly far enough to threaten major population centers — but slip below the Israeli missile defense system. Israel, in cooperation with the United States, has spent billions of dollars developing a two-tier anti-missile system that uses Patriot and Arrow missiles to destroy incoming targets like the Scud missiles that pounded Israel during the Gulf War. Although Patriot missile batteries have been set up around Haifa, no missiles have been fired in the current crisis, said Ben-Ari, who works for the CSIS International Security Program. "There's really no time to engage Katyusha rockets in a safe manner," Ben-Ari said. The trajectory is too flat and the flying time is too short for a Patriot missile to effectively track and destroy them. "Theoretically, yes, you could shoot rockets down with Patriot missiles," Pike says, "but you would be firing several million dollars worth of Patriots for several thousand dollars of Hezbollah rockets. You'd run out of Patriots way before Hezbollah ran out of rockets." The Israeli and American militaries had been trying to develop a high-tech laser to defend against these kinds of rocket attacks. But after nearly 10 years in development, the project was never completed. Pike said the Nautilus Tactical High Energy Laser "dropped off the radar" about three years ago. Ben-Ari said the United States pulled out of the joint project to focus on anti-ballistic missile defense projects. Over the last few days, the Israeli military is trying a new approach. It has dispatched Navy warships to the coast near Haifa in the hope that they can shoot down rockets with weapons used to defend against anti-ship missiles. "How effective they will be is a question," Ben-Ari says. "It's mostly for psychological effect. The people see the military is doing something to protect them." Hezbollah has also revealed a new part of its arsenal with its cruise-missile attack on an Israeli warship on Friday. "That's a signal that there's no way of knowing what they have up their sleeve," Ben-Ari said. "There are systems on Israeli navy ships to protect against this, but they weren't even turned on." The missile that hit the ship was far more advanced than anything Hezbollah has used before. 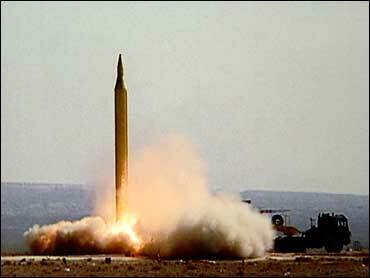 Israeli officials said the radar-guided missile was actually fired by Iranian soldiers in Lebanon. However, Hezbollah leader Sheik Hassan Nasrallah has repeatedly denied that his fighters receive weapons or training from Iran. "I completely deny the presence of any Iranian troops," he said in a televised address on Sunday. "Lebanese are the ones firing these weapons. They talk about Iranians to diminish and humiliate us as Lebanese and Arabs, that we don't have the capabilities and experience." In an exclusive interview with CBS News correspondent Richard Roth, Syria's Vice Minister for Foreign Affairs, Fayssal Mekdad, flat-out denied that Hezbollah receives any weapons from his country or Iran. However, analysts don't think Hezbollah fighters are well-trained enough to build or fire the advanced weapons themselves. "The more advanced the capabilities, the less I think this is a purely Hezbollah capability and the more Iranian fingerprint are on it," Ben-Ari said. "They definitely can't build it themselves," Pike said. "The question is whether they can operate it themselves." The question now is: does Hezbollah have any more surprises to unleash on Israel? Israel has warned that the guerillas have long-range missiles that could put Tel Aviv in their crosshairs, and there is no way of telling exactly what weapons are hidden in Lebanon until they are fired. Ibrahim Mousawi, a spokesman for the group in Beirut, told CBS News correspondent Lee Cowan, "Hezbollah has many surprises that have yet to unfold, so they have to expect more things."